For many of us, college is the first step on the road to achieving our dreams. The financial stress of tuition and living costs, however, can often stand in the way. If you’re a parent or guardian of a college student, you might be able to save yourself and your family a whole load of worry – and money – by applying for an HUECU Family Student Loan. With competitive interest rates and no origination fees, the right family loan will leave your children free to get on with the important stuff – their future. 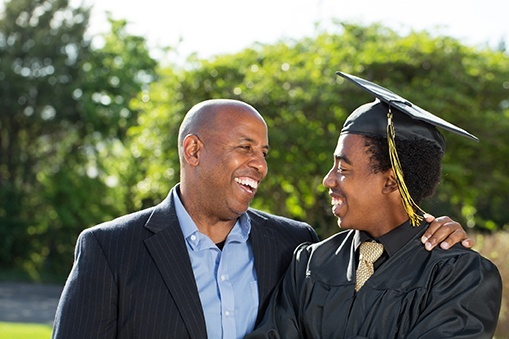 A family loan is specially designed to help parents or other family members cover education-related expenses for a student. This takes a good deal of financial pressure off the shoulders of the student, leaving them to be free to make the most of their college opportunities. What’s more, because parents nearly always have a better credit score than their college-aged children, they can apply for more competitive loans and save the whole family money. What does a family loan cover? College costs seem to come from a thousand directions at once, comprising everything from housing, to food, to surprise expenditures like a new laptop if the old one breaks. Family loans will cover whatever your child might need, from technology, books and living expenses, to the cost of tuition itself. With HUECU, for example, parents can take up to $25,000 per academic year or up to $100,000 in total to help cover planned and unplanned costs as they arise. A family loan can offer lower fees and better interest rates than other types of loans or financial aid. The HUECU Family Student Loan has no origination fees and a low interest rate, which is often a better alternative to student options such as the Federal Direct PLUS Loan. A good family loan also offers the benefit of less stress – by sending loan funds directly to the student’s school, parents can be sure that bills will be paid automatically and on time. But, can you also apply for other loans? Yes. Parents are eligible to apply to as many different federal or private loan providers as they wish. Along with considering your family loan options, parents are also advised to help their students fill out a FAFSA form in order to assess their financial aid options. If your child’s growing to-do list means you haven’t yet found time to fill out a FAFSA, don’t worry – private borrowers don’t need to submit a FAFSA in order to apply for a family loan. No. As long as their credit history is reasonably strong, parents can apply quickly and easily for a family loan that will help their child attend college. And, if you choose a loan provider like HUECU that offers family loans with no origination, application or disbursement fees, you can save even more. Most importantly, the right family loan should be designed with the needs of parents and students in mind – helping children make the most of their education, and giving their guardians a simple and financially sound way to help cover some of the expenses of school.